My Nephew's wife, Phoebe, asked me to make her sister a pair of baby booties. I had used this pattern before and liked how they turned out. So, I gave it another go. Aren't these just too cute? I've embarked on my first Sock Journey. I have to admit, I was really scared...at first. But I've been watching some awesome videos on YouTube and this persons website. She makes it look SOOOOO easy. Which really, after I started, it kinda was. I mean, I've had my fair share of stressful moments. Because keep in mind, I'm not a good Knitter. I kept making stupid mistakes and dropping a stitch and making my stitches so tight this sock could be waterproof! So I restarted from the 1st sock I had cast on for. 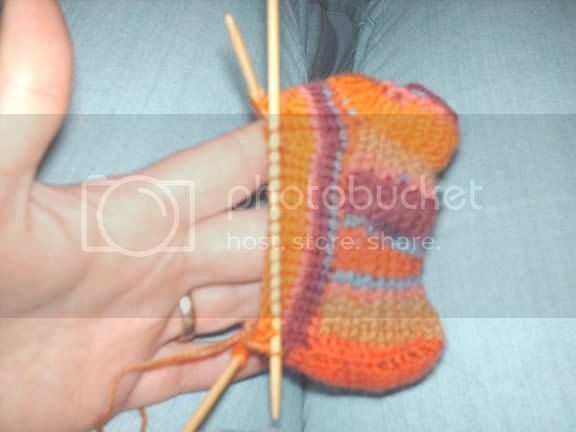 The shaping of the heel and the Gusset really threw me for a loop because I was watching a video for a totally different sock pattern but the concept is the same. I'm just not that smart at Math and trying to convert the # of stitches so it pertains to the pattern I'm actually working on was a little challenging for me. I'm happy to say the 2nd one is going much much better than the first one started out. So far..... 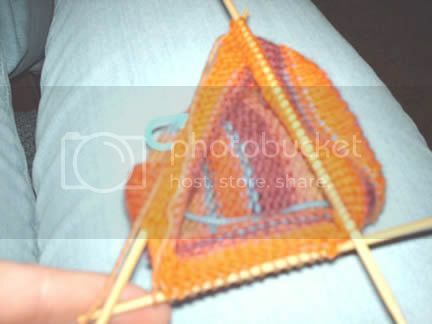 The heel pattern is boxy which I don't like very much, but since it is my first attempt at a sock I'll just go with it. And find a better way to do it the next time around. I'm surprised at myself because I really am enjoying this. I honestly didn't think I would. Back in December I had finished the Jolly St. Nick pattern from the Nov/Dec Issue of Crochet Today. I had submitted via email a note and the picture of my completed item. Well I went to the Post Office today to see if my newest issue had arrived and after I got back in the car I was flipping through it. Low and behold, guess what I see in it? I was so excited my heart was pounding and I had this huge silly grin on my face. I've never been published in anything like this before. It was just way too cool. So I am tooting my own horn just a little and wanted to share the scanned photo of the magazine insert on my project.